This week has been so mundane, but thankfully has clipped right along. The work situation looks like it will be blowing up in about a day or so due to some poor practices . . . not looking forward to that. 1). Our house has a fan in the bathroom, for the first time ever. Meaning . . . our bathroom is fully operational right now. It is gorgeous and I never thought possible to say this, but completely worth the year long wait. We've just got some trim work and accesorizing to do before I feel the reveal will do it justice. It's just so beautiful Tony and I kept walking into it and sitting on the tub or toilet just to take in the view. Tony said that if we move, we're taking the vanity with us. I wouldn't even blink an eye putting that in our contract. Tony's Dad crafted us a beautiful vanity and it would be a shame to leave it behind. 2). Drum roll please . . . . . Isaac's walking! Unfortunately our point and shoot is MIA, so we don't have readily accessible video to show off here. We did manage to get it on the real video camera though! He's growing more and more confident each day. The look of excitement on his face is just precious, because you can just see how pleased with himself that he is! It's amazing. My little man is an actual little man and no longer my teeny baby. I can't wait until it's nice out again and we can get this little guy dirty! He just wants to roam! 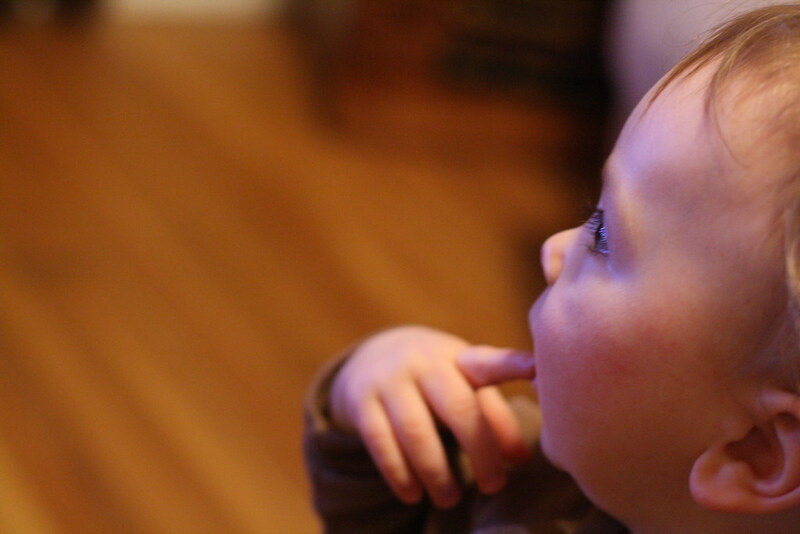 Oddly enough the only TV Isaac is ever interested in watching is hockey. 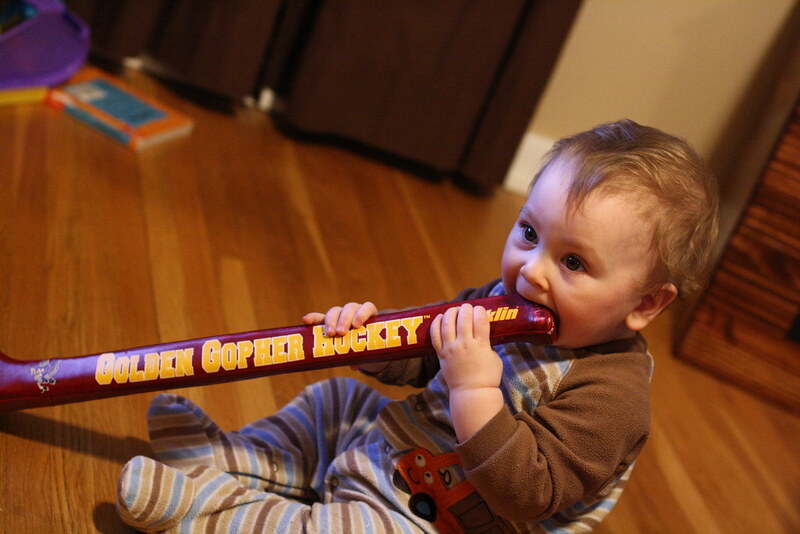 His absolute favorite toy is his Gopher hockey stick. 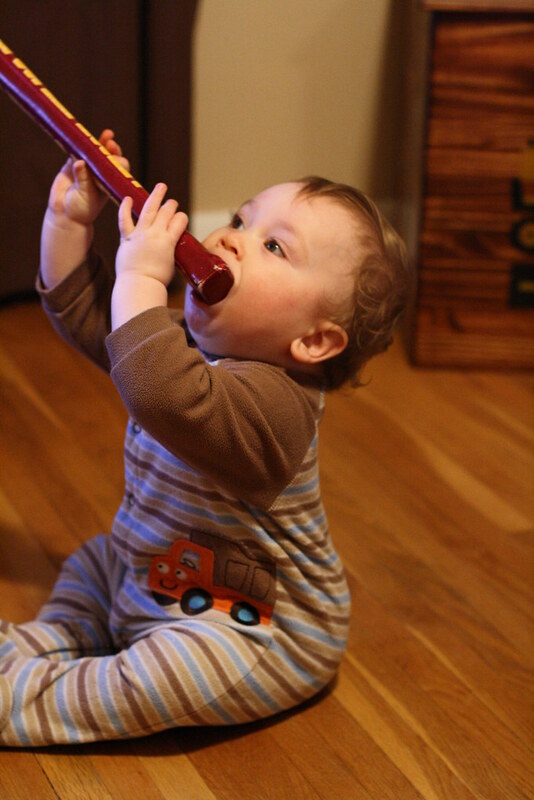 He loves to hit the soccer ball, football and various other toys with it. And of course chew on it . 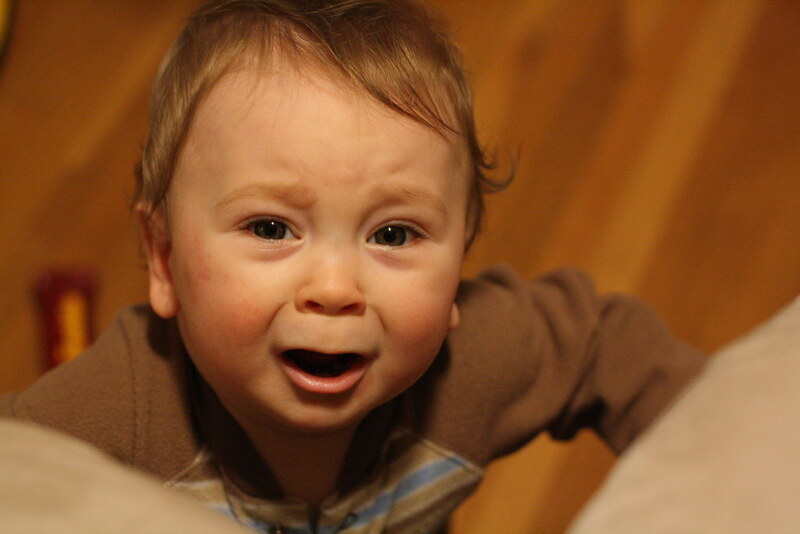 . . he's definitely teething again, working on the top 4. 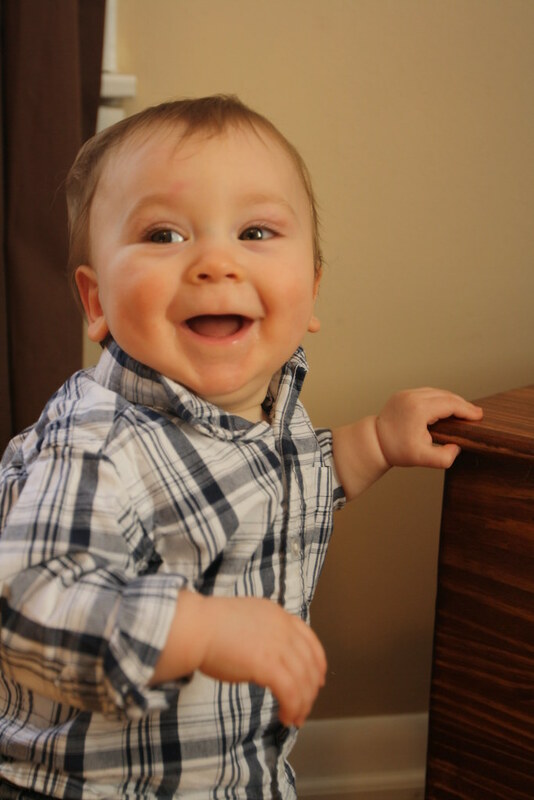 But he's still just the happiest baby ever. And as cute as they come! Holy cow you're going to have a hard time keeping the girls away from your house in about 15 years! Woohoo! Congrats on your walking little man! Big milestone! I cannot wait for the big reveal! I can only imagine how beautiful it is. GO ISAAC!! That is so exciting! 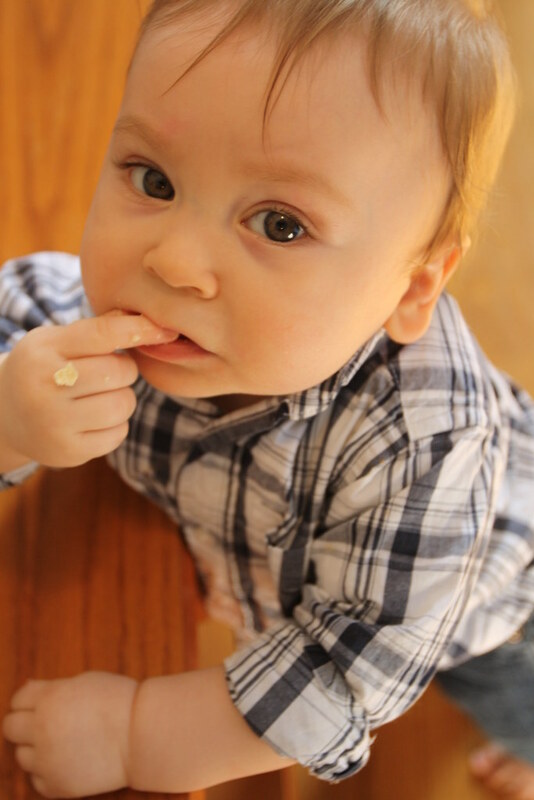 He is now offically a big boy...and as adorable as ever! On a lighter note! I can't wait to see the bathroom reveal!!! And how exciting that you little guy is walking! I can't believe how big he is getting. 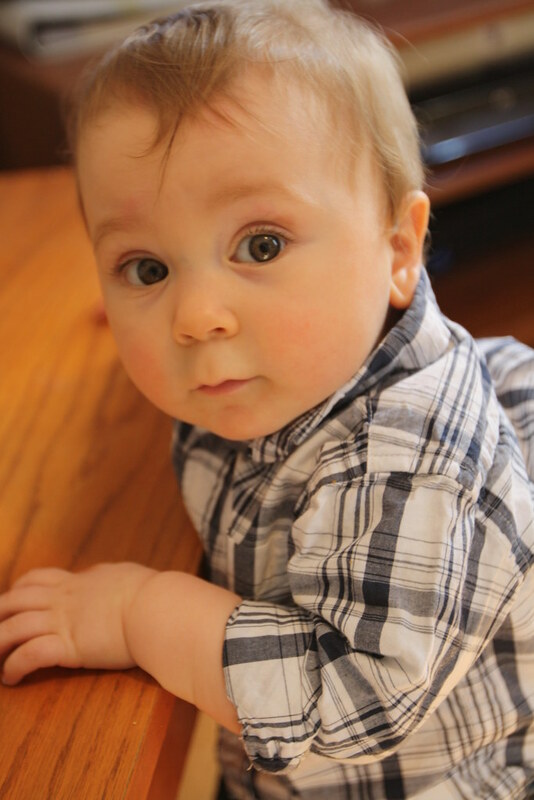 Isaac is such a cute little man! Can't wait to see the bathroom! Can't wait to see the reveal. Congrats on the little man walking. He is just too cute! I love how you've captured all of his expressions! I can't believe his walking already! (And it's amazing how fast the walking turns into running!) He looks like such a little boy now. 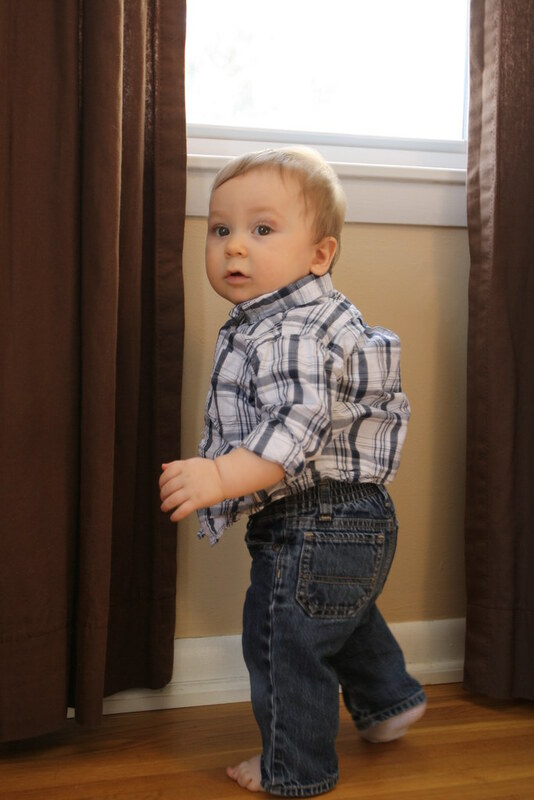 I can't believe he's walking already! Next thing you know, he'll be skating around a hockey rink! oh my goodness! what an advanced little guy! i bet he is sooo happy being able to walk around! :) kinda bittersweet, huh? adorable though! yay for the little walker! SO cute. Congrats on your walking baby! He is so adorable! Awww, congrats on the walking - that's so fun (and terrifying!). So cute! Enjoy him getting excited when he walks now...it won't last long. Juan acts like he's been doing it for years now! It is so cute how happy they get though! Yay! Now that's he's walking you'll be able to do some fun stuff with him this summer!! Watch out though...he'll be into everything! He's getting so big! also...I love when they walk. I think its SO much easier than when they crawl! ENJOY! 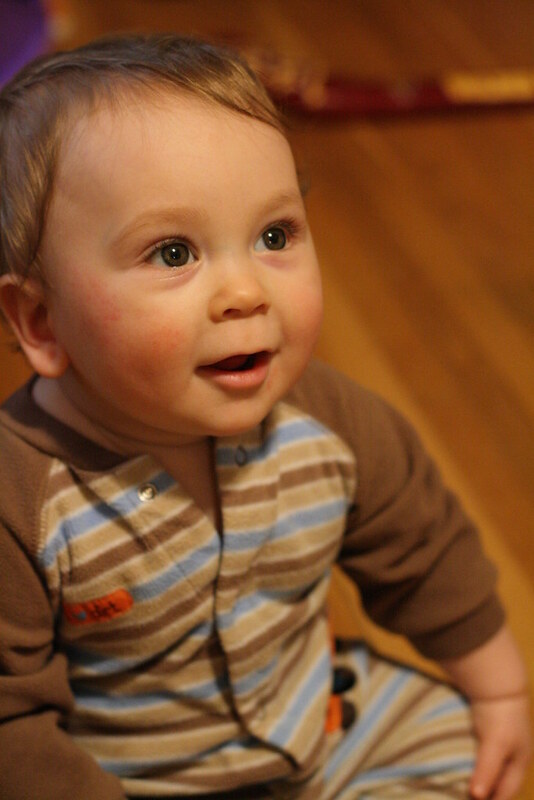 I can hardly believe he's 9 months already...and WALKING!